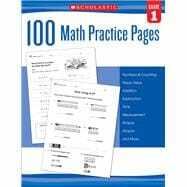 With this collection of 100 eye-catching, reproducible practice pages at their fingertips, teachers will find it easy to reinforce grade-level, standards-based math skills. The pages can be used any time students need to work independently and many include fun formats to boost motivation. A perfect way to support students who need extra practice with numbers and counting, place value, addition, subtraction, time, measurement, shapes, graphs, and more! For use with Grade 1.